Sprout Social vs. Hootsuite is a comparison of two social media tools that both do a lot. Both products function as management hubs for multiple networks, so deciding between the two isn’t just a question of choosing the longest feature list. To find the advantages of one software over another, you have to look at the manner in which they execute their functions. Which solution has the most streamlined publishing? The more in-depth reporting? To help you answer those questions and choose the right option for your needs, this article compares Sprout Social and Hootsuite based on dashboards, publishing, scheduling, collaboration, reporting, and integration capabilities. Founded in 2010, Sprout Social was built to help businesses and customers communicate more freely. In the six years since its inception, the company has raised $60 million in venture capital from Goldman Sachs, Lightbank, and NEA. Sprout Social was designed to give businesses an array of functionality while keeping the user experience inviting. Notable customers include Dove, Microsoft, and Evernote. Hootsuite was founded in 2008 under the moniker BrightKit. It’s mission was simple: help businesses manage their social media accounts in one place. BrightKit eventually became Hootsuite, and the software is now used by more than 10 million people. Notable Hootsuite customers include Virgin, Mailchimp, SXSW, and Monster. Any true social media management tool will aggregate posts from multiple networks. The way the platform displays this information has a significant impact on usability. Both Hootsuite and Sprout Social aggregate posts in a feed, but the way each product displays the feed is substantially different. Hootsuite lets users build adjacent feeds across a single dashboard and customize the type of information that each feed displays. That means you can set up a feed for each of your social accounts and create more specific filters on each of those accounts — e.g. posts from Facebook or incoming tweets. Once you have your feeds set up, you can interact with the content displayed in each one directly from Hootsuite, which makes responding to questions and comments across multiple networks a breeze. Sprout Social foregoes the multi-columnar approach of its competitor and instead aggregates posts into a single feed. You can customize the information in the feed by checking and unchecking filters, and you can also move to a network-specific view (for example, everything from LinkedIn) with one click. 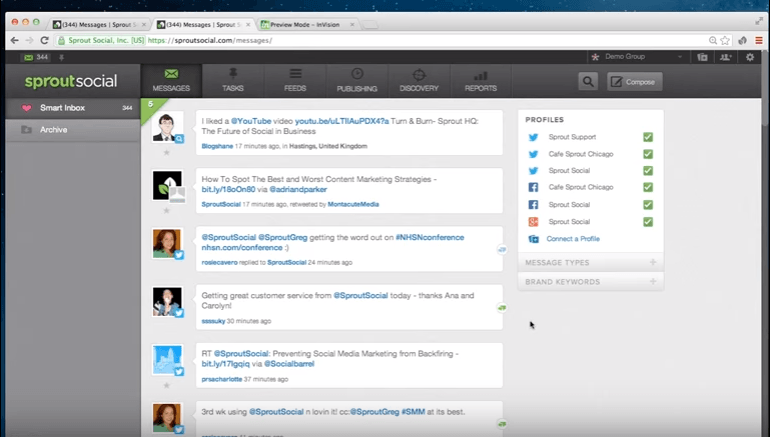 Like Hootsuite, Sprout Social lets you interact with and respond to messages directly from your feed. It also tracks which messages have been responded to and marks them with a green icon to prevent multiple users from responding to the same message. This is a minor feature, but it makes collaboration among team members much less complicated. There isn’t much difference in the publishing functionality of these two platforms. Both allow you to author a message, choose which account it comes from, attach photos, shorten links, and choose a target audience from the main feed dashboard. 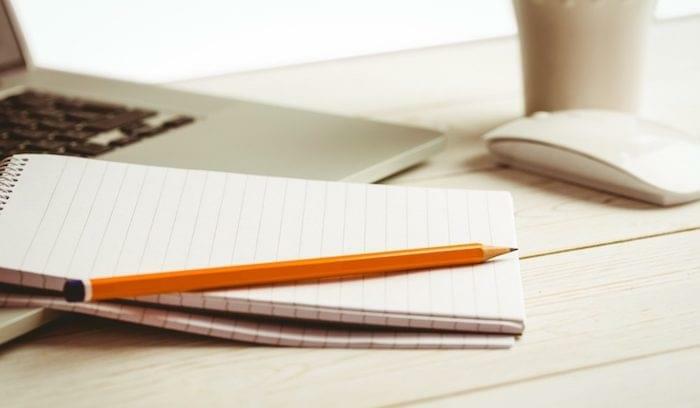 Both products also offer a draft function so you can save posts that aren’t ready for publication and return to them later. 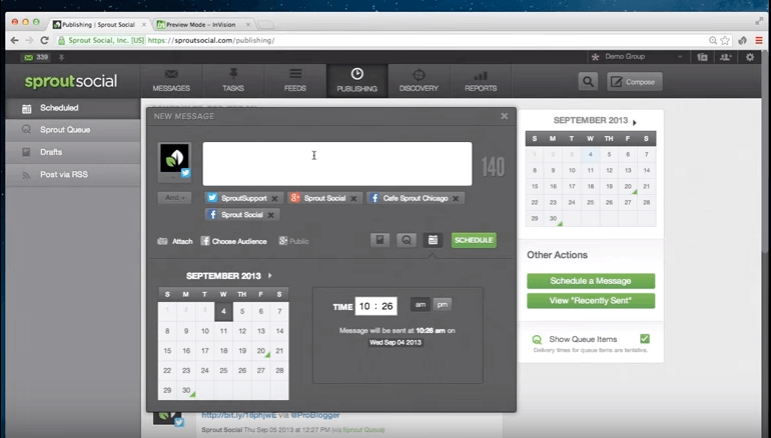 Hootsuite lets you schedule up to 50 posts by uploading a CSV file. Sprout Social offers some extra data in the publishing department with its audience discovery function, which highlights people or accounts you should follow and spammy or robotic accounts you should probably unfollow. Sprout Social also shows a brief history of your conversation with someone on Twitter if you’re about to respond to their message. It pulls this data from its social CRM functionality, which is covered in more detail in the Extras section below. In terms of scheduling, Hootsuite and Sprout Social both offer a content calendar so you can schedule posts ahead of time. If you want to automate your posts, each system can choose posting times for you. Both platforms also use a proprietary algorithm to decide which times you should post to elicit the most engagement from your audience. Collaboration in the context of social media software mostly refers to permission settings and publishing approval rules. Hootsuite lets you assign users one of three roles: super admin, admin, and default. If you want to manage employee accounts through Hootsuite, you can apply one of the three permission settings to an entire team. Sprout Social offers similar administrative functionality, with permissions set based on a user’s role and multi-step publishing approval. 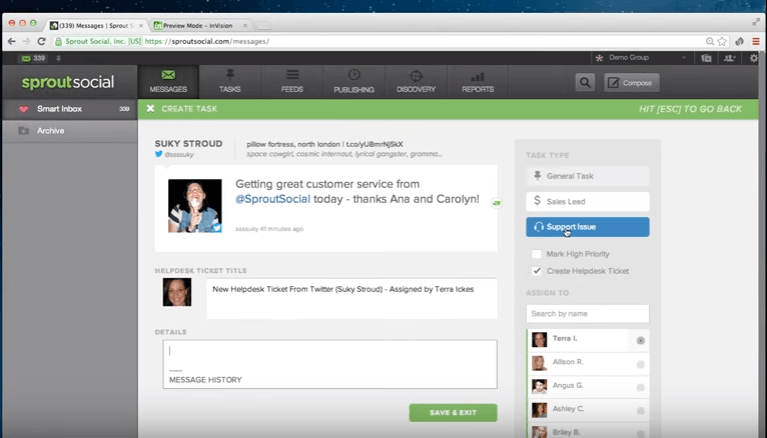 Sprout Social users can also tag any post in the feed as a task and assign it to a person or team. Tasks are divided into three categories: sales, default, and support. You can view open and completed tasks under the Task tab. To ensure two people don’t reply to the same post in the feed view, Sprout Social will show when another user is responding to the post. For larger social teams, this feature can save a lot of time and prevent awkward double responses. 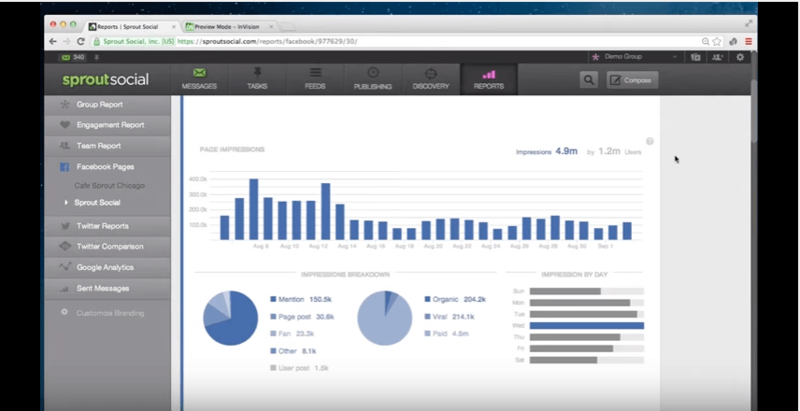 In terms of reporting power and customization, Hootsuite is the more advanced platform. The overview report divides your social accounts into four views: posts, followers, engagement, and metrics. Sprout Social can’t match Hootsuite for customization, but like the rest of the platform, it’s reporting is practical in its own way. There are channel-specific reports for Facebook and Twitter as well as an overview report that includes all social networks. Sprout Social also includes a task completion report that displays the productivity of each user — even down to how long it takes them to complete a task. 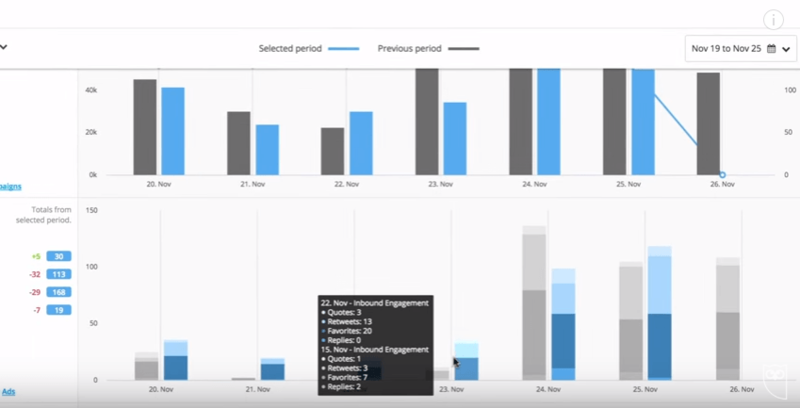 Finally, there’s an engagement report that estimates the number of response-worthy messages your team has addressed. Hootsuite also has an upper hand in the area of third-party integration. 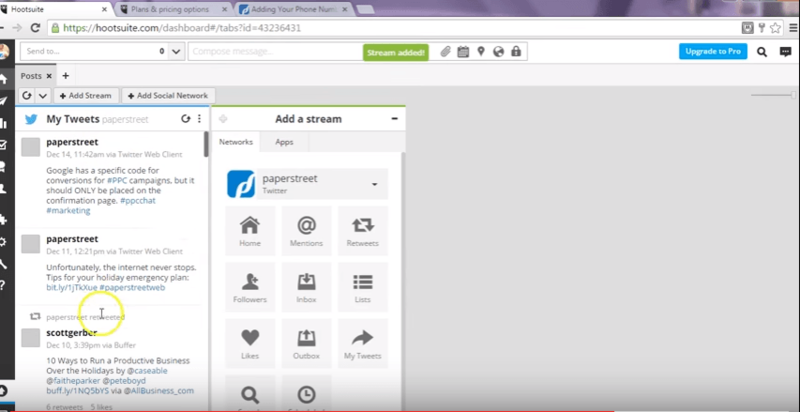 Hootsuite integrates with Twitter, Facebook, Google+, and LinkedIn. They also have an app directory stocked with over 150 native integrations — 127 of which are free. As an extra, Hootsuite users can make a landing page and run social contests and giveaways using the Campaigns function. Sprout Social is compatible with the major networks mentioned above and provides native connectors for Zendesk, Uservoice, and Google Analytics . . . not much else. What Sprout Social lacks in integrations, it makes up for in extras — namely, its “social CRM.” For every account that follows you or that you follow, Sprout Social creates a record that stores interaction history as well as basic contact information. This information can be immensely helpful for salespeople, another way to build marketing and sales alignment. 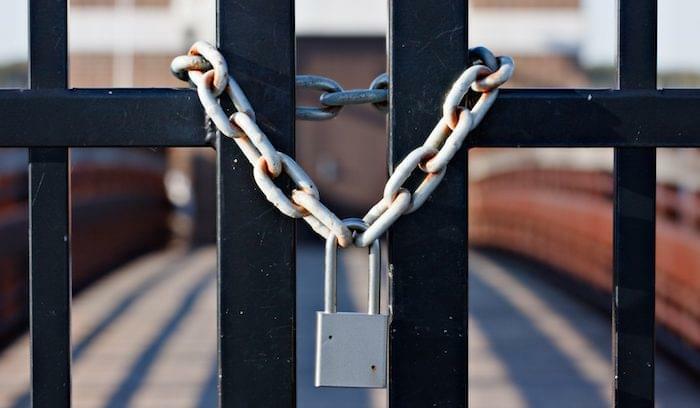 Sprout Social and Hootsuite both license their products in three-tiered subscription models. Higher tiers are more expensive, but they also unlock more functionality. From a design perspective, Sprout Social is much easier to look at and use. Hootsuite favors function over form. 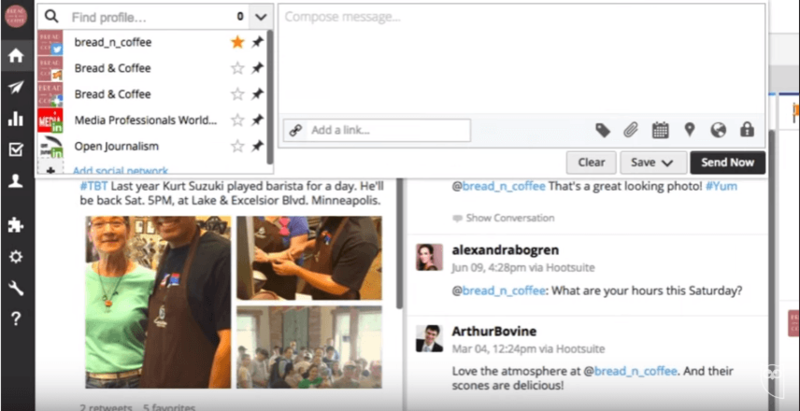 Hootsuite has the edge in reporting, though Sprout Social offers more extras, like social CRM and audience discovery. In the end, it depends what you’re looking for. 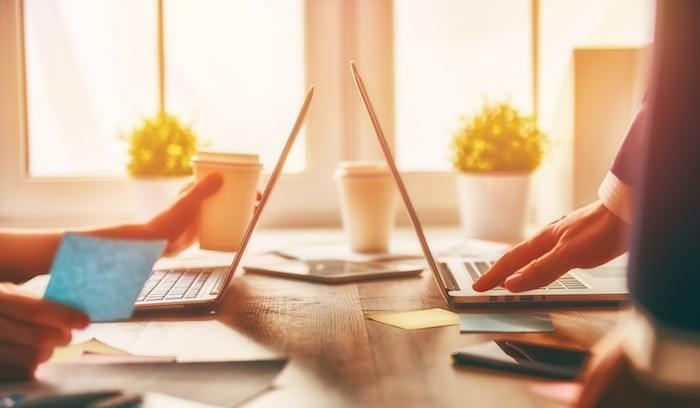 Both solutions are excellent tools for managing your social media, but the difference lies in which capabilities are most important to your organization. If you’re having trouble deciding, re-examine your requirements. Then schedule a call with one of our experts and get a free consultation and personalized product recommendation. 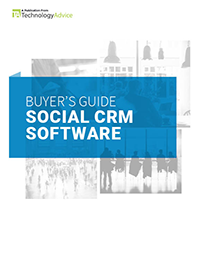 Learn more about the benefits of Social CRM with our market-leading research. 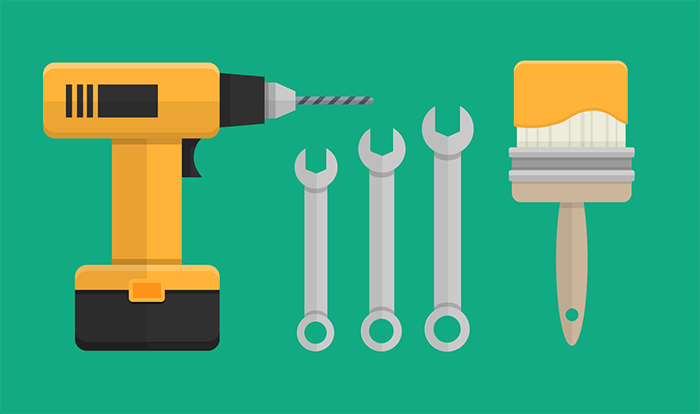 Should You Build Your Own CRM? Many people create multiple social media accounts and later find it too difficult to keep their profiles updated on all the sites, but I think that Hootsuite is an excellent choice for handling multiple social media accounts by logging into a single dashboard. Thanks for the input, Duke!